More than one month after Hurricane Maria made landfall, electricity service has not been restored to most residents of the U.S. territory of Puerto Rico. As of Monday morning, the Puerto Rico Electric Power Authority (PREPA) had partially restored service to 18% of customers in 35 of 78 municipalities. Hurricane Maria, a Category 4 hurricane, made landfall in Puerto Rico on September 20, bringing powerful winds, storm surge, and major flooding. PREPA reported all 1,570,000 of its electricity customers were without power after the storm. Hurricane Maria destroyed much of the territory’s transmission infrastructure, and as a result, outages linger even as power plants are being prepared to resume operation. On September 6, two weeks before Hurricane Maria made landfall on Puerto Rico, Hurricane Irma passed just north of the island. In the days following Hurricane Irma, nearly 900,000 customers in Puerto Rico were without power, based on data compiled in the Department of Energy's Situation Reports. 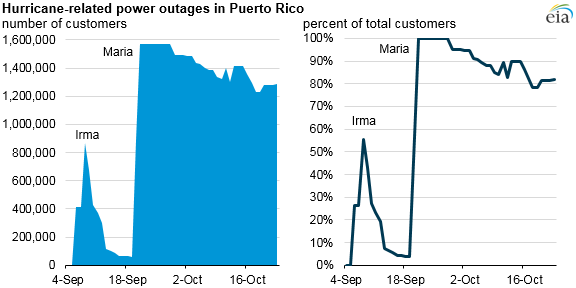 By September 19, just prior to the arrival of Hurricane Maria, PREPA had restored power to 96%, or all but about 63,000, of Puerto Rico’s electricity customers. 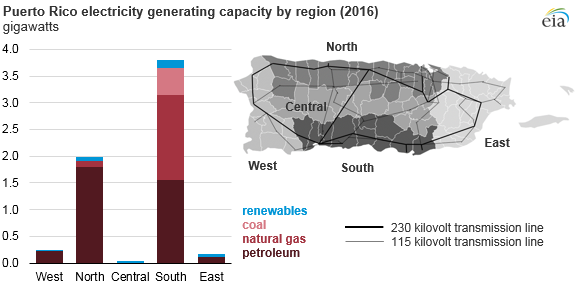 Almost two-thirds of Puerto Rico’s electricity generation capacity is located in the southern portion of the island, and most of the population is concentrated in the north. Some of the electricity generated in the south of the island must be transmitted on long-distance transmission lines to the north, but many of those transmission lines were damaged by Hurricane Maria. Several smaller power plants are located along the coastal areas in the eastern and western portions of the island and supply electricity to local population centers. PREPA is working with U.S. federal partners and private industry to restore electricity to the territory. Immediate projects include providing power to facilities such as hospitals, shelters, schools, and water pumping stations. The U.S. Army Corps of Engineers awarded contracts to provide temporary power stability to the San Juan metropolitan area, with a planned operation date of October 25. More information about the federal government’s response to Hurricane Maria is available in English and Spanish through the Government of Puerto Rico and Federal Emergency Management Agency (FEMA).